Italian cruiserweight Mirko Larghetti is out with injury and in on short notice comes Brit Stephen Simmonds (15-1) as opponent for Noel Gevor October 14 in Hamburg. 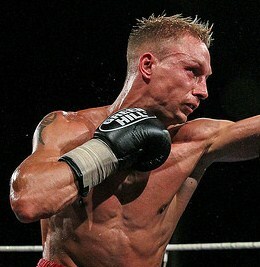 Gevor defends the WBO International title in this fight that tops Sauerland Event's show at the Inselparkhalle. On the undercard local superwelter Sebastian Formella (13-0) square off against Cheick Dioum (8-0-1) and lightheavy Abel Gevor (11-0) take on Norwegian Alexander Hagen (9-1). Promoter Pekka Maeki in Finland have a megashow in the works for December 17 at the Hartwall Arena in Helsinki. Nothing is confirmed yet but Juhani Gronberg writes at knock-out.dk that the plan is to have EBU lightweight champ Edis Tatli making his mandatory defence against Italian Manuel Lancia on top of the bill. A second main event will feature EU supermiddle ruler Mariano Hilario taking on Niklas Rasanen in what is a mandatory defence. A third mainevent may see WBC female Eva Wahlstrom defending her title. And as special co-feature; the Nordic Nightmare, heavyweight Robert Helenius will fight on the bill. However, and now it gets interesting, Gronberg writes that Helenius was more or less set to fight the very same day at the Icehall in Lahtis with Kalle Keskinen's Loud'n Live promoting. Maeki reportedly offered more money and Helenius walked out off a fight against Brazilian Marcelo Luis Nascimento. There are rumors of some kind of agreement between Keskinen and Helenius´ manager Markus Sundman and the matter may end up in the courts. Prior to today's story there were also rumors flying about Maeki Boxing's financial status but if all above is correct then the status will be pretty good because it features the biggest ticket sellers in Finnish boxing. All parties involved have declined to comment on what goes on.